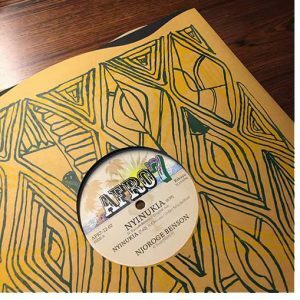 After the successful release of the first Afro7 twelve inch by Kenya’s Kiru Stars, which sold out in a matter of days when it came out in 2015, the Helsinki-based label is back with the second volume in its DJ-friendly series. The new record explores territory that remains unknown to most of us: the sound of Nairobi dancefloors in the early ‘90s as interpreted by two Kikuyu musicians. The original 45rpm releases came out at the very end of the vinyl era in Kenya. Musically they mark the influences of (garage) house, hip hop and new jack swing, in addition to the musicians’ early influences including Kikuyu music, soul, disco and reggae. Both ‘Nyinukia’ and ‘Dai’ – which come in an original version and a remix – translate well to the musical tastes of 2016. Francis Njoroge is a veteran in the Nairobi music scene who’s still performing and recording today. 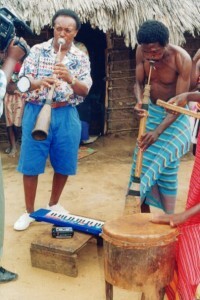 He’s often remembered as the keyboard player of Makonde, the late ‘70s disco/funk group of ‘Manzara’ fame. His later work includes an album with the group Radi (recently reissued as an edit), Jabali, and finally a solo single that came out on an obscure label. ‘Dai’ is a mid-tempo groover built around a programmed drum beat, a rolling bassline and the synth licks of Francis Njoroge. The vocals – sounding like an early inspiration to The Very Best’s singer Esau Mwamwaya – are entirely in Kikuyu, Francis’ mother tongue. Kenyans are often considered to have an eclectic musical taste, and this can be witnessed in the night clubs of Nairobi and Mombasa where the latest house, dancehall, rock and coupé décalé mix seamlessly with local hits. Kikuyu pop of the ‘70s and ‘80s doesn’t just build on traditional music or benga, but takes a lot from country & western and soul/funk. In that diverse landscape, it’s no big surprise that ‘Nyinukia’ sounds like a US garage house producer set up shop in Nairobi around 1994. The single was the b-side of a solo release by Chris Kariuki, alias Njoroge Benson – a lawyer by profession – who’s better known for his reggae/dancehall inspired songs of the late ‘90s, and having been a member of early ‘80s boogie-funk group Gravity. AFRO-12-02 comes with the original songs as well as remixes; the original remix b-side of ‘Dai’ is included, and for the remix of ‘Nyinukia’ Afro7 called in the help of Finnish producer Didier Selin who edited the song into extended length for DJ use. The twelve comes in a thick silk pressed outer cover custom made in Thailand, courtesy of Maft Sai of Zudrangma Records. 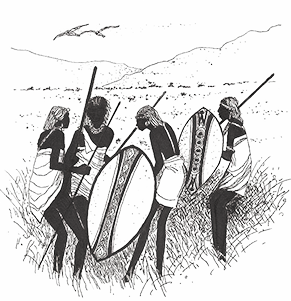 The Kikuyu pattern was done by California-based artist Steve Roden. This release is strictly limited to 350 copies. Buy “NYINUKIA / DAI” directly from AFRO7.net (good rates on international shipping! €5 to Europe, €10 to the rest of the world.) or purchase it from selected record stores worldwide. Press here to see what shops stocks this release. © AFRO7 records 2016 – All rights reserved.